Three people have been killed and four others are "level one trauma patients" after a helicopter crashed near the Grand Canyon Saturday afternoon, according to Hualapai Nation Police Chief Francis Bradley. Chief Bradley said a Papillon Airways aircraft carrying a pilot and six passengers crashed in the Quartermaster Canyon sometime around 5:20 p.m.
During a Sunday afternoon press conference, Chief Bradley confirmed that all six passengers were from the United Kingdom. Authorities released the names of the victims who survived the crash Sunday night. The pilot, 42-year-old Scott Booth and passengers, 29-year-old Ellie Milward, 32-year-old Jonathan Udall and 39-year-old Jennifer Barham, were all flown to the University Medical Center in Las Vegas where they're listed in critical condition. The three people who died in the crash were identified by authorities as 27-year-old Becky Dobson, 32-year-old Jason Hill, and 30-year-old Stuart Hill. Dispatch received the emergency call regarding the crash at 5:31 p.m. Multiple agencies are assisting in the investigation. 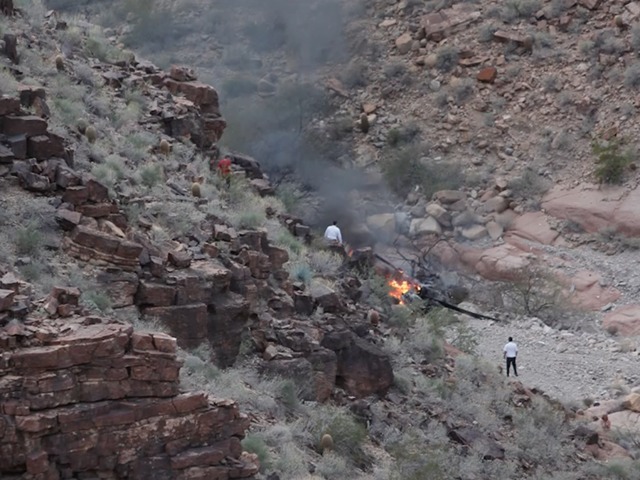 Allen Kenitzer with the FAA Office of Communications confirmed in an email that the helicopter, a Eurocopter EC130, "crashed under unknown circumstances in the Grand Canyon." He said the helicopter was on a tour and the helicopter "sustained substantial damage." Bradley said rescue efforts were hindered by high winds, darkness and extremely rugged terrain where the crash is located. The recovery efforts wrapped up around 2 a.m. Sunday. Bradly extended condolences to the family, friends, and relatives of the crash saying, "It's a very tragic incident, and I would like to personally commend the first responders who were involved in the recovery efforts." The only access to the crash site was by helicopter or on foot by hiking 20 miles. The pilot, who survived the accident, suffered injuries to at least "one of his limbs," officials said. A second person suffered burn injuries, and no information was provided regarding the two other patients. Sergeant Les Tarkowski, with the Mohave County Sheriff's Office Search and Rescue Team, says his team has extensive experience with the terrain where the crash happened. “That’s one of the reasons they called us. We’d been up there a few times for rescues and because of the terrain we had rope people – we had rope teams that can navigate the rugged terrain,” said Sgt. Tarkowski. The FAA and the National Transportation Safety Board will be investigating. In 2001, six people, including the pilot, were killed in a crash. The tour had stopped at Quartermaster Canyon and was on its way back to Las Vegas, where the tour began when the helicopter crashed. Isaac Braun, the father of the lone survivor of this crash, says this most recent incident gave him flashbacks. "What happened with my daughter, it's happening again," said Braun. In a Monday afternoon press conference, NTSB officials said three of their investigators arrived at the crash site Sunday and have begun analyzing the pilot's certificate, history, aircraft records, as well as the airframe of the aircraft, the engine, and weather conditions.